Newly-married couples are so in love. They are the happiest couples in the world and their mind is full of beautiful things that they have been dreaming of. A happy couple deserves a romantic bedroom that can make them so deeply in love. 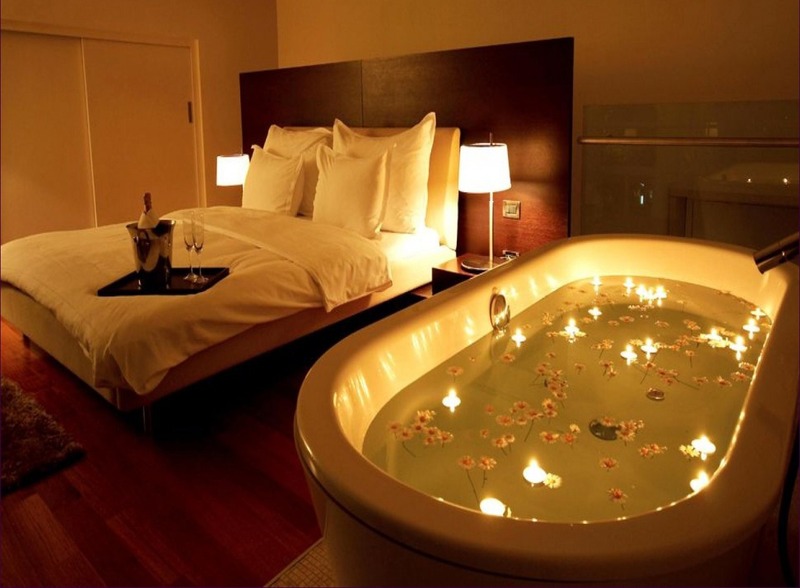 Therefore, check out these 10 romantic bedroom ideas for couples that you should try. Love is all about deep affection and honesty so your bedroom has to embody your affection and honesty through the use of color palette. This bedroom reflects your feeling well. Your affection is represented with the romantic pink while your honesty is represented with the pure and clean white. White is chosen because it does not only give the idea of honesty, but also makes the room look tidy, clean, and spacious. A round mirror hangs over the headboard, creating a perfect focal point in this romantic bedroom. Putting some beautiful flowers in a vase can perk the romantic feeling up. Creating a romantic ambiance is not only about concocting colors, but also using the appropriate lighting. Adequate to bright light produced by the recessed LED lights is good, but the dim light of candles is better when it comes to create a romantic moment. This bedroom is a perfect place to create a romantic moment with your spouse. The use of earthy colors such as beige and brown provides a soothing feeling. The dim light of the candles hanging on the wall and perching on the dressing table perfects the moment well. Gray usually gives the touch of boldness. Soft gray, however, always provides the touch of elegant and romantic ambiance. 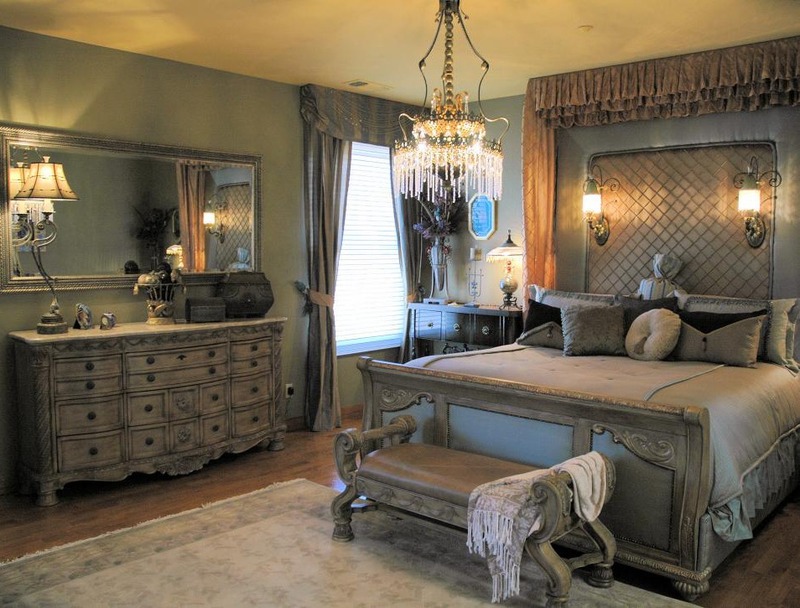 This bedroom looks elegant with beautiful and sophisticated decorative lamps hanging over the bed. Similar lamps also hang on the wall on both sides of the bed. A furry gray rug lies beneath the bed to keep your feet warm. Gray curtains help you get your privacy as well as protecting you from the glare without compromising the exquisite look. The embossed headboard and rocking chair add texture to your bedroom which makes it look more exquisite. Red roses have been widely used to express one’s affection for decades. No wonder you can find many roses on Valentine’s Day. Now you can do the same with your spouse, but you will do it in a different way. Take the rose petals to the next level. 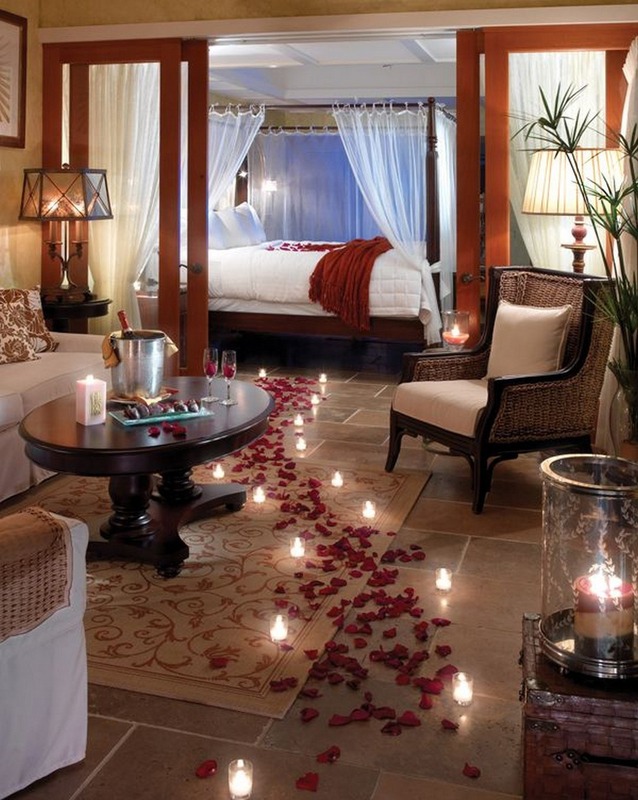 Instead of literally roll out the red carpet for your spouse, you can spread out some rose petals on the floor and put some candles along the petals so that it makes a wonderful pathway to the bed. Your spouse is going to love and remember it forever. An exclusive spa in a bedroom with your spouse can be a terrific idea. It can add a relaxed ambience to the bedroom and boost the romantic feeling. If you are going to add a bath tub next to your bed, make sure that you keep the bed simple without any curtain around it and don’t forget to put a rug next to the tub. This bedroom might look old, but not obsolete. It is even romantic and marvelous. The well-worn drawers comprise sophisticated accent that make the bedroom look classic. Soft satin bed cover does not only provide the best comfort, but also makes the bedroom look more elegant. The skirted curtains complement the bed cover well as well as making a fantastic centerpiece. 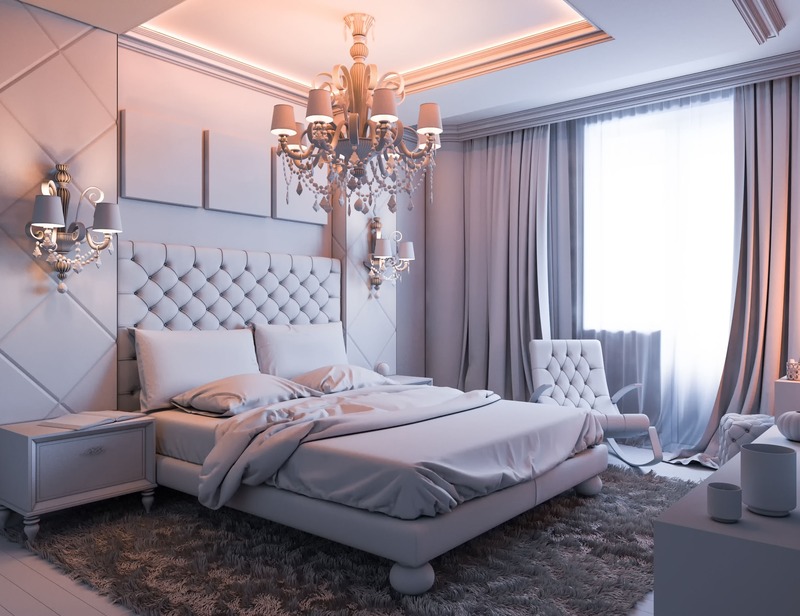 Another elegant thing of this bedroom is the golden pendant light that hangs over the bed, spreading the romantic dim light throughout the bedroom. Combining a red color and magenta is not a bad idea as magenta represents the highest level of love. Besides, magenta can probably make you happy as it is the color of happiness. The magenta lamp shade hanging over the bed covers the LED light well, alleviating the bright light and turn it into soothing light. The huge shade makes it look like a conspicuous giant purple flower. 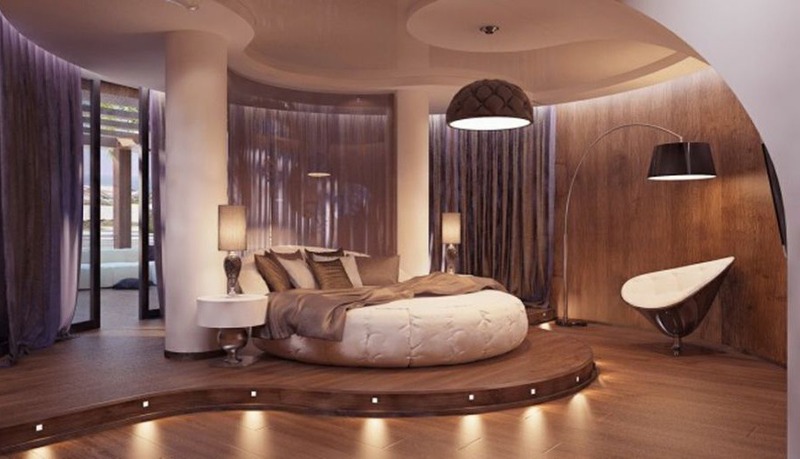 This bedroom denotes futuristic style due to the glass interior and the clean-line furniture. 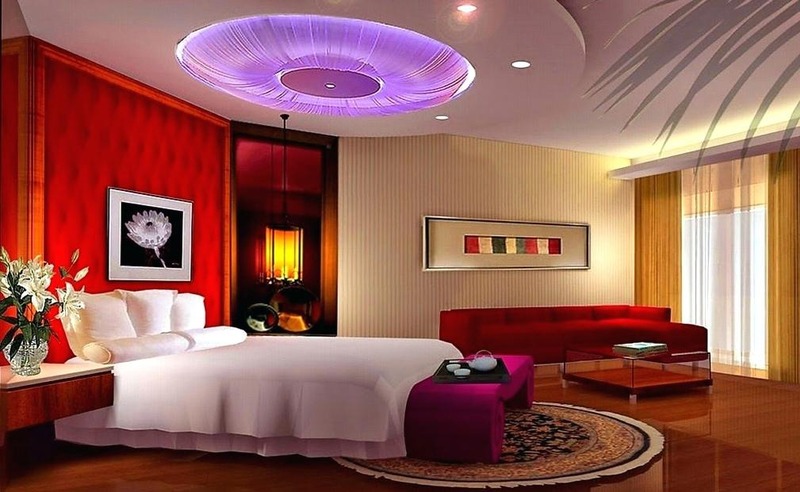 The comfortable white bed sits on the elevated transparent floor which features exquisite pink light. The light shines under the bed and passes through the transparent floor, making the bed look as if it were floating. The curvy white chair can draw everyone’s attention in no time due to its peculiar design. Talking about drawing attention, some small circular mirrors and bigger circular ornaments hang on the wall over the headboard, creating a splendid focal point. The mid-century modern interior can create a romantic bedroom that always gets both of you to stumble into the deep love and conjure up the images of when you met and blushed for the very first time. When stepping into the bedroom, you can still feel your heart pounding just like when you met each other. The bizarre round white bed lies on the elevated wooden floor. Two round white posts stand on both sides of the bed, anchoring it perfectly. Some recessed LED lights are installed around the elevated floor, making it look like a stage in which you play a romantic love story with your beloved spouse. This bedroom does not only look romantic, but also lavish. The golden finish teaming up with the fine carved patterns make it look eminently elegant. The satin white bed cover is so soft that you will wish you could lie on it all day long. 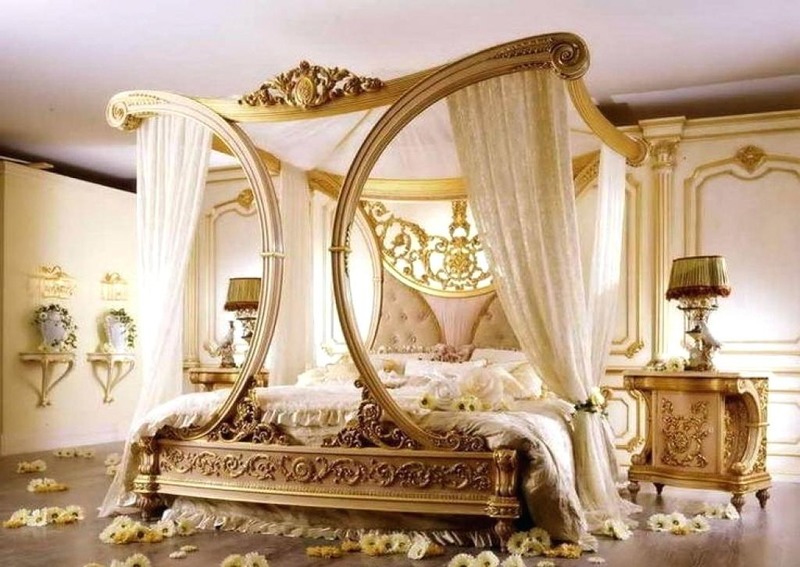 The white transparent curtain hangs around the bed, making it look as adorable as a king’s and queen’s bed. To kick it up a notch, you can spread out some flowers that have the same hue as the bed. Those are 10 romantic bedroom ideas for couples that you can try to implement to your bedroom. Making your spouse happy is not that hard. You only need to bring back the feeling and the memory when you are so much in love by refurbishing your bedroom as romantic as possible.